Union Finance Minister Arun Jaitley said that banks have to play an important role in achieving the higher growth rate in the country. He said that the banks would be provided sufficient funds to recapitalise them. 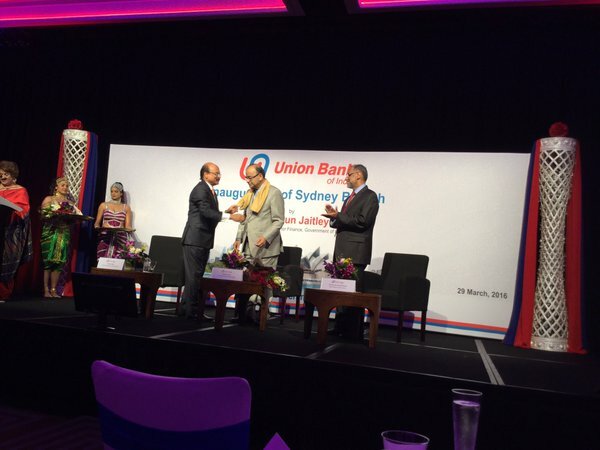 The Finance Minister was speaking at the inauguration ceremony of the Sydney Branch of the Union Bank of India in Sydney, Australia today. Jaitley is on a four day official visit to Australia. The inauguration was done by Arun Jaitley, Finance Minister of India in the presence of High Commissioner of India in Australia Navdeep Suri and Arun Tiwari, Chairman & Managing Director, Union Bank of India among others. The Union Bank of India is the 5th largest Nationalized Bank in India. Established in the year 1919, the Bank has grown to a business mix of Rs. 5,89,889 crore, with deposits of Rs 3,27,412 crore and advances of Rs 2,62,477 crore, as of December 2015. Union Bank offers products and services for Retail, Agriculture, MSME, Large Corporate and NRI customers through 4153 branches, which includes 3 overseas branches and 6999 ATMs, dedicated call centre operating 24*7 in 9 languages and alternative channels like internet banking and mobile banking. The Union Bank of India recently launched Mobile Wallet “Digipurse” with features of Bill Payment, DTH Recharge, Mobile Recharge, Online Shopping through virtual card and fund transfer facilities through IMPS, in addition to launch of Union Selfie and online account opening. These add to already comprehensive digital offerings through various modes.